Two old men sat on a bench at the park, one tall, balding with a pot belly and the other short, bearded and skinny. They both stared at the pond, the ducks floating on it and at the children playing on the jungle gym. From time to time they looked at each other and smiled. When someone parked his small foreign car in front of them, the skinny man tapped the fat man and pointed. He shook his head, keeping the smile on his face. “Oui, oui.” He nodded and shook Billy’s hand again. “I’m sorry, Jim, I thought you said you had to go pee. Gosh, it’s hard to talk to a foreigner.” Billy thought a moment. “Do you wanna go over there to the stand and get a sody pop? You know, sody pop?” He motioned like he was drinking from a bottle. “Yeah, you can do a lot damage with that there champagne. What I was talking about was a Coca Cola. You know, Coke?” Billy made shape of a Coca Cola bottle with his hands. “J’aime les femmes.” He pointed at a woman sunbathing in the park. This entry was posted in Pictures and tagged short story, storytelling on July 10, 2018 by jerrycowling. I always like me some literary insight while I’m having fun. 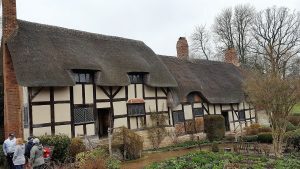 Our tour bus stopped at Anne Hathaway’s cottage in Stratford. We had to wait in line because we arrived a little before they unlocked the door. We could have been distracted by beautiful blooms in the garden but the plants hadn’t budded yet. I think everyone has seen a picture of the Hathaway house but we took one anyway. Yes, it has a thatched roof. Yes, it is a long two-story house. Yes, it is bigger than you thought, but not that big. 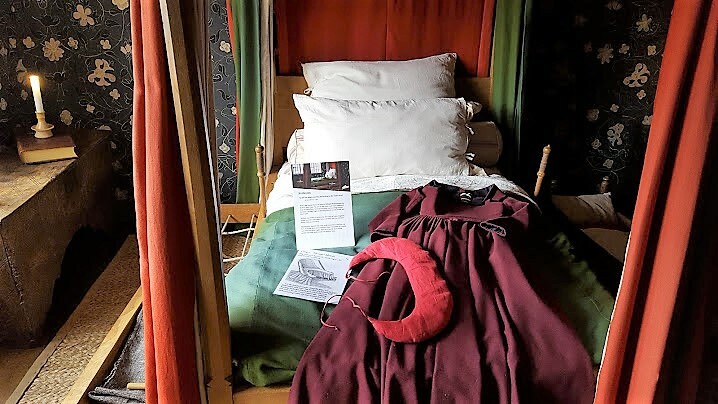 For the sixteenth century it has a lot of nice things, including beds. 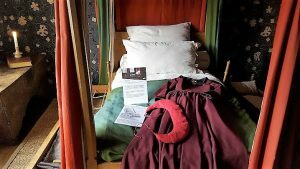 Speaking of beds, the guide explained the whole thing about how William Shakespeare left his wife his second best bed in his will. Admit it, we all thought Will was a cad for leaving his wife the second best bed. Just like most sound-bites in history, there’s much more to the story. Back in those days, there weren’t very many inns in the countryside, and many people in the country, whether they liked it or not, had to take the trip to London once in a while and had to stay somewhere along the way. To make a little money, most people rented out a bed to weary travelers. And which bed would you want a stranger with money to have? The best bed in the house, of course, so it had to be empty and clean at all times just in case someone knocked at the door. So the head of the family used the second best bed, which probably was the marriage bed. A romantic gesture to leave to your wife, when you think about it. Also a financially sound one too. The best bed was still available to rent out to travelers, which continued to be a source of income for the widow. We also thought Will was some illiterate ragamuffin who spied the girl in the big house down the road and decided to marry her. Then we saw his birthplace house. It wasn’t all that small. His father was a successful tradesman, so the ragamuffin theory went out the window. We did see the bed where Will was born and it was as nice as any bed in the Hathaway house. Both houses had lovely gardens. This is when I realized why Will left his family in Stratford when he went off to work in theater in London. 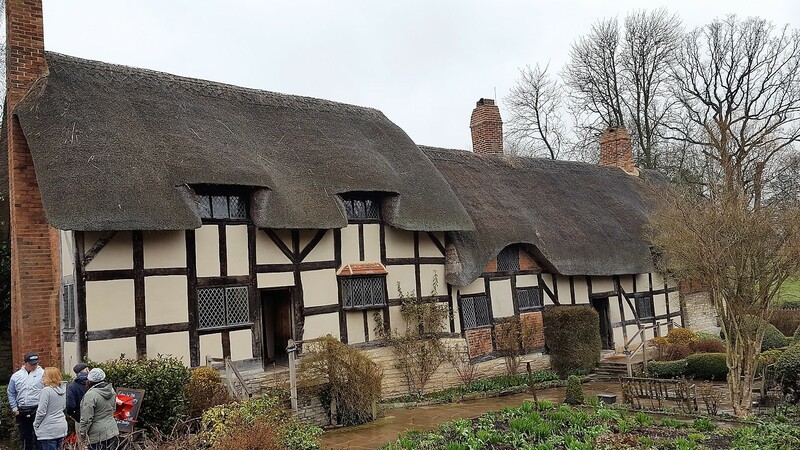 If you had a choice of living in a pretty country town with a nice house and garden or in rat-infested, plague-ridden London with all sorts of unnamable waste in the street, wouldn’t you want to be in Stratford too? So instead of being this lowlife scum who abandoned his poor family for a glamorous show biz life in the big city, he left them safe and happy among friends and family to try to make a living from the only talents he had, writing and acting. And he could only do that in London. After I got mired down into university course Shakespearean Tragedies 303, I saw a statue of a court jester in the middle of the street. Will had a buddy in his acting troupe who was really funny so he wrote a role for him in every play, whether it made any sense or not. To get into the spirit, I had Josh take a picture of me trying to imitate the pose of the jester who had both hands in the air and one leg up. But I lifted the wrong leg so it didn’t make any sense at all. This entry was posted in Opinion, Pictures, Stories and tagged opinion, storytelling on May 8, 2018 by jerrycowling.